Venture into the deep swamp and experience Argonian culture like never before in Murkmire, The Elder Scrolls Online’s newest DLC game pack. Discover this new adventure and zone in addition to the free Update 20 base-game patch! We are thrilled to announce that the Murkmire DLC game pack and Update 20 base-game patch are now live on all platforms, including PlayStation®4, Xbox One, and PC/Mac. This new DLC is available free for all current ESO Plus™ members or can be purchased with crowns from the in-game Crown Store. In addition, Murkmire will be available as a Daily Reward during the month of November. The Update 20 base-game patch is available free for all ESO players. The Murkmire DLC game pack is free for all ESO Plus members or available for purchase for 2,000 crowns from the in-game Crown Store. You can find it within the in-game Crown Store listed under DLC. It is also available as a Daily Reward during the month of November! 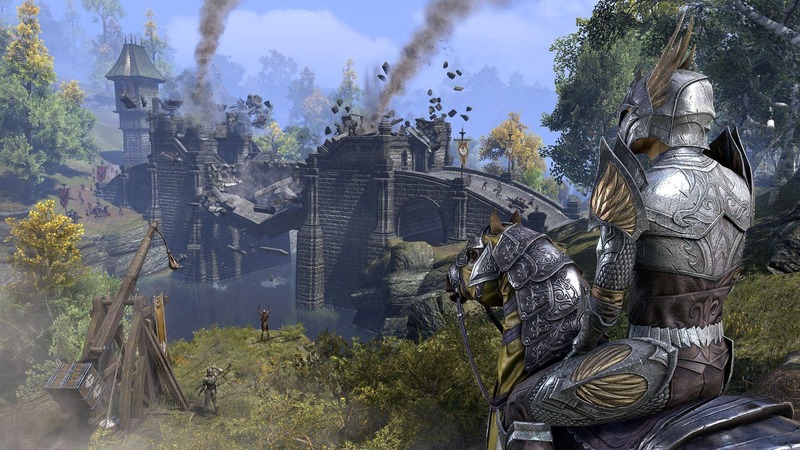 Note that if your ESO Plus membership lapses, you will lose access to the DLC game pack until it is renewed or purchased with crowns. You will not lose any items or rewards you earned while you had access. In addition to the DLC game pack, the Murkmire Collector’s Bundle is available for 4,000 crowns from the in-game Crown Store. 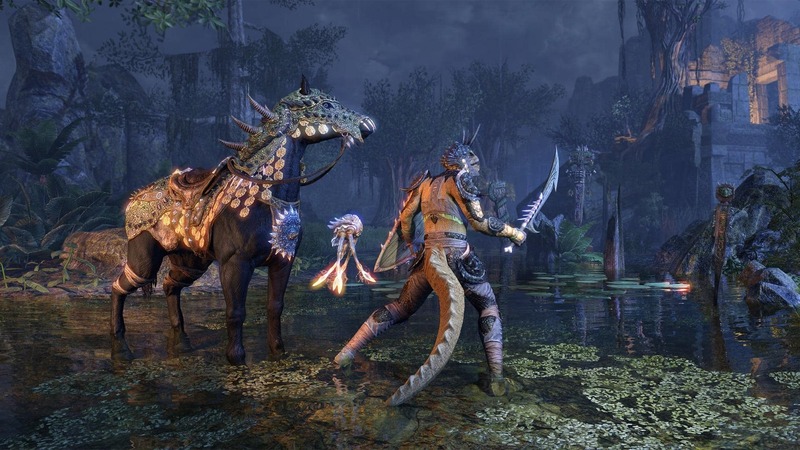 The Murkmire Collector’s Bundle includes the DLC game pack, the exclusive Shellback Warhorse mount, the Cantaloupe Swamp Jelly pet, and five Crown Experience Scrolls. You can find and purchase the Murkmire Collector’s Bundle in the Featured section of the in-game Crown Store. 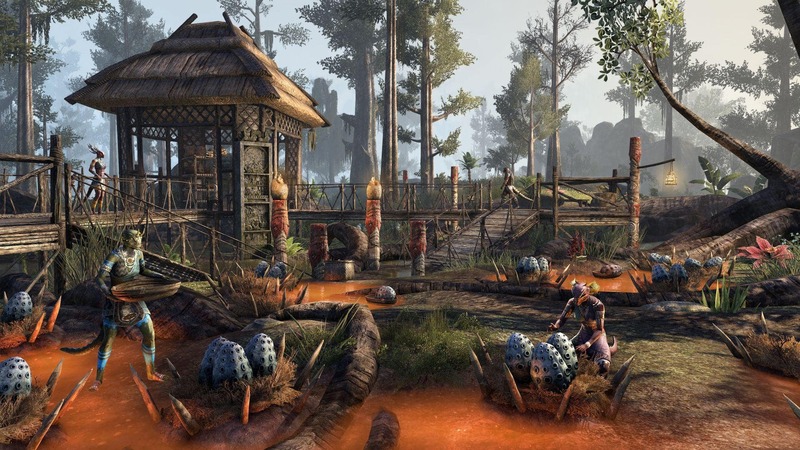 During the month of November you can pick up the Murkmire DLC game pack for free, simply by logging into the game. To acquire the new DLC, you must log in and claim a reward for 24 of November’s 30 days. Even if you have an ESO Plus membership and already have access to the new content, you can completely own it by logging in over the month. 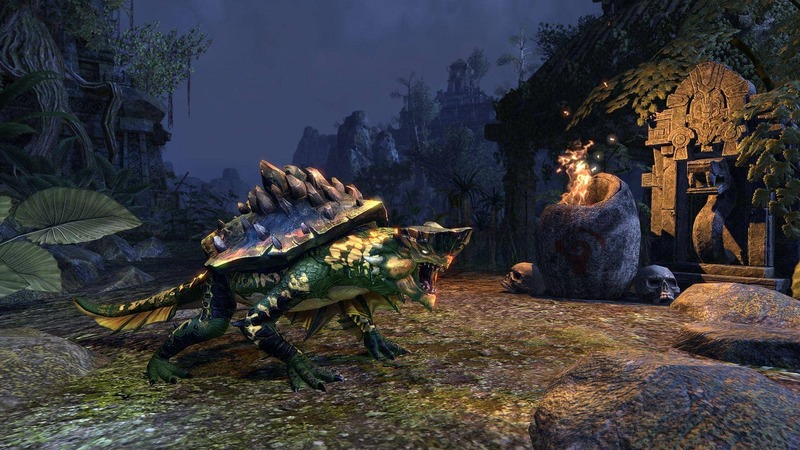 Once you have acquired Murkmire, the moment you set foot in Black Marsh’s southern coast, you’ll receive the Verdigris Haj Mota pet, completely free! Trust us—he’s more cuddly than he looks! Arriving alongside the new DLC game pack is the free Update 20 base-game patch. This update has a host of improvements, fixes, and changes to ESO’s core experience, but it also introduces a series of new and exciting features that can be enjoyed by all ESO players. If you’re an avid home decorator, you’ll be thrilled to find that Update 20 also introduces an Undo/Redo function and the ability to link items together. With these new tools, you’ll be able to more easily make both small and large adjustments to your home, taking some of the pain out of shifting large or complex scenes. In addition to this, we’ve also added the first of the upcoming Music Boxes, allowing you to bring a little ambiance to your home. You can pick up the new Music Box from the Housing Editor for 800 crowns. In addition to the above new features, Update 20 also introduces the ability to reorder your character select screen and brings a host of improvements to ESO Plus starting November 13. No matter how you play, Update 20 has something that’ll help you get the most out of Tamriel! Be sure to check out the Patch Notes forum for everything that’s coming with this update. Venture into the deep swamp and discover an environment that is equal parts beautiful and perilous. Uncover the long-lost history of the strange Saxhleel people and face the Black Marsh’s many hidden dangers. Great adventure, knowledge, and rewards await those brave enough to explore the dark swamplands and mossy ruins of Murkmire – will you? Head on over to Twitter @TESOnline and Facebook to let us know if you’re planning to set off on an expedition of your own!